Identification: The body of this species and the inner bases of the cerata are translucent rose flecked with yellow or white. The middle part of each ceras is slightly swollen and bright white. There are thin yellow and rose rings subapically and the tip is pale blue shading to white. The rhinophores are flecked with white. Natural history: Abronica sp. #4 is a rare species that has been found in moderately protected to exposed rocky habitats and Halimeda kanaolana beds at depths of 1-15 m (3-50 ft). It lays a pale pink egg mass. The eggs hatch in about three days in the laboratory. Distribution: Maui, Oahu and Kauai: also known from Papua New Guinea, the Marshall Islands and Indonesia. 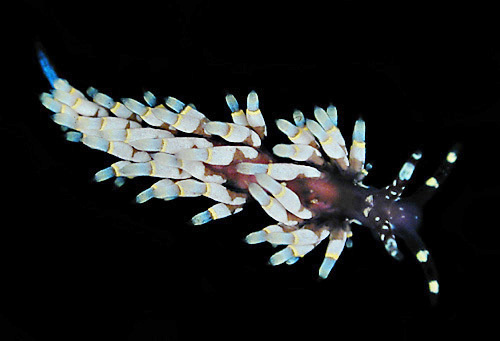 Taxonomic notes: It was first recorded in Hawaii from Maalaea Bay, Maui by CP on May 7, 1991 and was formerly placed in the genus Cuthona. Photo: PF: 7 mm: off Makena, Maui; May 9, 1999.